Happy (almost) Friday. It has been a good but a long week here. Not only is it bone-chillingly cold (I live in Minnesota and it is so cold here that they cancelled school—and remember that’s in Minnesota where we are used to the cold. -40 wind chill!) but the week has also been long because my husband has been traveling for work all week, to balmy California. I am excited for him to return tomorrow! Supplies: Felt, Needle and matching thread. 1. Cut out 5 identical pedals. Above you can see I have the pedals cut out for several flowers, each a differnt size. I experimented with narrow pedals and plump pedals and liked the variety it gave my completed flowers. 2. Stitch through the base of each pedal, up one side and down the other. As you stitch make sure you are stitching on the same side of each pedal (as shown above) by laying out the pedals as you stitch through them. 3. Once you stitch through each pedal, stitch through the first pedal again. 4. With the pedals flat on the table, pull the thread tight until the pedals are gathered tight at the center, each pedal folded once in the middle. Stitch through the back of the flower several times to secure and tie off the thread. Then I used a pair of jeans from the rag pile for the background of the hoop and attached the completed flowers with hot glue. I really love how it turned out… It stinks having a husband that travels for work, but in the evening when the kids are in bed a get a little bit more crafting done! Love this so much. I just made an embroidery hoop flower last week. I’ve got to try out your version because it would be a beautiful addition to my inspiration wall where my other one is. Gorgeous! Just bought a bunch of embroidery hoops and was only planning to fill them with fun fabric…now, you’ve got my gears turning about adding felt flowers to them, too. Love it! So cute!! Thanks so much for stopping by and sharing your great ebroidery hoop!!! Hope you’ll stop by often!! Wonderful tutorial! The colour combination is amazing! So cool! I’m pinning this to the Monday Funday pin board! What a fun project. We just found your blog! visiting from southern lovely. This is BEAUTIFUL and caught my eye. What a great job! this is so cute, and it’s getting me in the mood for spring! This is super cute. I wonder if you could make a “No sew” version…I can’t even sew things this basic :(. Thanks for sharing at the Pinterest Challenge. I have an abundance of denim at my house that has been waiting for just this project! Thanks for sharing! I am visiting from Sugar Bee! What a great project! I’m pinning it! So sweet! Love the colors too! Thanks so much for sharing the great tutorial! Oh, this is a sweet project. Those flowers would look on anything, canvas, art journals… pinning! I love it! I can’t wait to make my own. 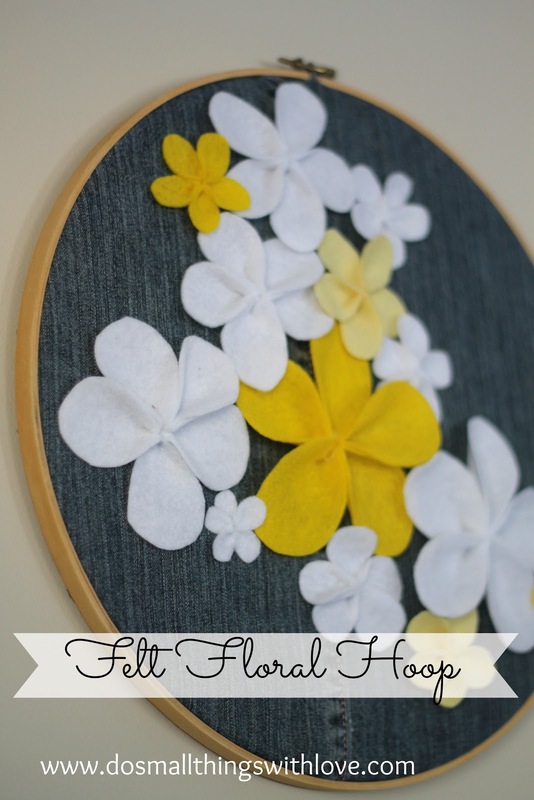 This is an adorable project and a great way to showcase some fabric flowers. Nice job! That’s just as cute as can be! This is gorgeous – I love your petal details. very pretty! You make such wonderful projects with felt! I love felt…a little too much if you ask my husband. Love this! So simple yet looks amazing 🙂 My to do list just keeps growing! I’m pinning this because I didn’t know how to make these flowers. This is a great tutorial. Thanks so much!